Published: Dec. 27, 2011 at 04:12 p.m. Updated: Dec. 23, 2014 at 04:56 p.m. Naturally, a sign of a great career -- in most cases a Hall of Fame career -- is the number of Pro Bowls a player is selected to play in. Now that the Pro Bowl roster has been revealed, see who leads the way in number of appearances. 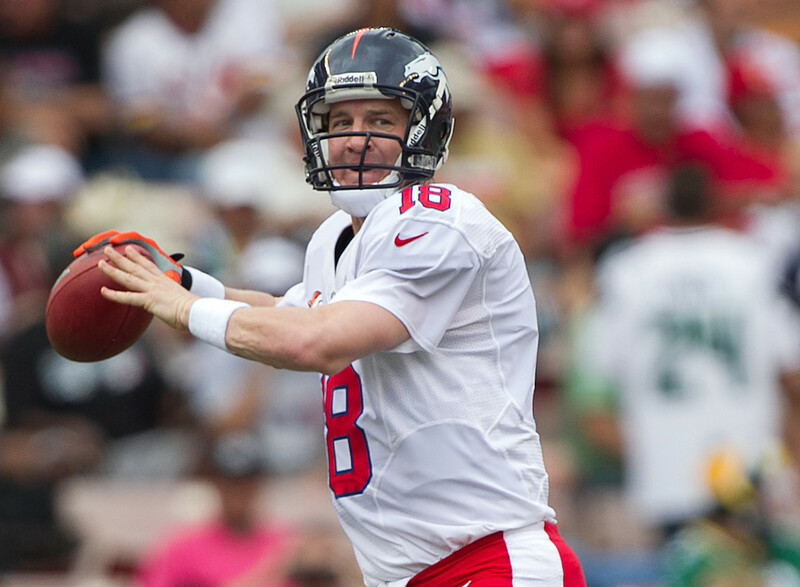 Peyton Manning went to his first Pro Bowl in his second year with the Indianapolis Colts. Since then, he has been voted in every year, except for 2011 when he was out with an injury. Matthews spent his entire career along the interior line of the Houston Oilers/Tennessee Titans. After no appearances during his first five seasons, Matthews was voted to 14 straight Pro Bowls. He was inducted into the Hall of Fame in 2007. Olsen, who was a force among the Rams' famed "Fearsome Foursome," was selected to the Pro Bowl in all but the final season of his Hall of Fame career. Tony Gonzalez was selected into the Pro Bowl 14 times, starting in 1999. He made 10 appearances as a Chief, and capped his career with four appearances with the Falcons. Naturally, the man many consider to be the greatest of all time has been voted to his share of Pro Bowls. A 20-year career resulted in 13 selections for Rice. His final appearance came after the 2002 season, at age 40, in which he helped lead the Raiders to the Super Bowl. White could get to the quarterback like no one else, and for that the "Minister of Defense" was voted to the Pro Bowl 13 straight years from 1986 to 1998 with both the Eagles and Packers. From 2000-2007, Bailey earned seven straight Pro Bowl selections with both the Redskins and the Broncos. He was voted in four more times with the Broncos before retiring in 2013. Houston's illustrious, Hall of Fame 14-year career included 12 straight Pro Bowl selections from 1968 to 1979 with the Oilers and Redskins. Otto played his entire Hall of Fame career at center for the Raiders and was voted to 12 straight Pro Bowls from 1961 to 1972. McDaniel was a staple along the Vikings' interior line, resulting in 11 straight Pro Bowl selections from 1989 to 1999. The Hall of Famer's 12th selection came in 2000 as a member of the Buccaneers. Shields played 14 seasons in the NFL, all with the Chiefs, and was voted to 12 straight Pro Bowls to close out his career. As the heart and soul of one of the NFL's stingiest defenses, Lewis went to the Pro Bowl 12 times in his 17-year career. Perhaps the most beloved Chargers player in the team's history, San Diego's favorite son was voted to 12 straight Pro Bowls from 1991 to 2002, his final year with the team. He never made another appearance in seven subsequent seasons with the Dolphins and Patriots.